The medical term for Ingrown hairs is Psuedo Folliculitis Barbae (P.F.B. ), Psuedo Folliculitis Barbae refers to an ingrown hair which has been cut or broken off below the skin level which then begins to grow through surrounding tissue rather than out of the follicle. In other ingrown hair cases, hair curls round and starts growing back into the skin causing irritation and inflammation around the ingrown hair. Other related conditions are razor rash & razor burn. In more severe cases infection can set in causing spots and even cysts. It has been know for cysts caused by ingrown hair to require surgery which leaves scarring. Prevention is always the best policy. For years Aloe vera has been a traditional treatment for ingrown hairs. When it is combined with the other ingredients in Aloe Clear it becomes supercharged with powerful moisturizers and exfolliants. This allows the Aloe vera better access to the skin. For ingrown pubic hair along the bikini line, use Aloeclear 2-3 times a day to soften the skin and help the hairs work their way out by exfoliating and intensely moisturizing the skin. Wear loose-fitting underwear and clothing until the ingrown hairs are gone to avoid friction. Aloeclear dries as a gel glaze on the skin meaning it is resistant to being rubbed off by clothing. Apply Aloeclear as often as is required to pre existing ingrown hairs, those bumps will soon be a thing of the past. Regular use of Aloeclear will prevent the formation of further ingrows. Some people find it helpful to exfoliate the area before waxing to prevent the environment that can cause ingrown hair. This removes some of the dead skin cells in the top layer of skin cells that often contribute to ingrown hair. Using Aloeclear on the 3 days before waxing will exfoliate the area and bring about a dramatic improvement in the smoothness and softness of the skin, meaning far less ingrown hairs after waxing. When waxing, be sure to pull the hair out by the roots. Do not allow the hair to break below the skin surface which will cause ingrown hair. This is because the end of the hair will be frayed and be less likely to emerge cleanly from the follicle. Using Aloeclear protects against pubic ingrown hair and eliminates existing ingrown hair within days. 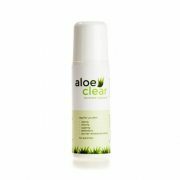 Ingrown hair irritation is lessened in just hours with Aloeclear’s soothing, cooling formulation! Use Aloeclear after shaving to eliminate razor rash and razor burn. Ingrown hairs around the collar will be a thing of the past! Simply apply instead of aftershave and your protection is complete. Do not apply after shave on top of Aloeclear as thisd can remove or reduce the effectiveness. Alternatively apply the aftershave of your choice and then apply Aloeclear roll on gel.